University of Oklahoma senior center Ty Darlington added to an already long list of off-field accomplishments Thursday when he was named one of 12 finalists for the 2015 William V. Campbell Trophy, which is awarded to an individual deemed the absolute best football scholar-athlete in the nation. The finalists were announced by the National Football Foundation and College Hall of Fame. Selected from a nationwide pool of 135 semifinalists from all NCAA divisions and the NAIA, Darlington and the other 11 finalists will each receive an $18,000 postgraduate scholarship as a member of the NFF National Scholar-Athlete Class, presented by Fidelity Investments. They will travel to New York City for the 58th NFF Annual Awards Dinner on Dec. 8, where their accomplishments will be highlighted in front of one of the most powerful audiences in all of sports. At the event, one member of the class will be declared the winner of the 26th William V. Campbell Trophy and have his postgraduate scholarship increased to $25,000. The recipient will also be honored at the NFF Board of Directors meeting and at a reception hosted by the New York Athletic Club on Dec. 9, and will then fly to Atlanta to be recognized during The Home Depot College Football Awards on ESPN at the College Football Hall of Fame on Dec. 10. "It's an honor to be considered for such an incredible award," said Darlington, who is an OU team captain. "Thank you to the National Football Foundation Awards Committee, and also to all of my family, coaches, teachers and staff who made this possible. Glory to God, and Boomer Sooner." Nominated by their schools, which are limited to one nominee each, candidates must be a senior or graduate student in their final year of eligibility, have a GPA of at least 3.2 on a 4.0 scale, have outstanding football ability as a first-team player or significant contributor, and have demonstrated strong leadership and citizenship. The 135 semifinalists were announced Sept. 24, and the class is selected each year by the NFF Awards Committee, which is comprised of a nationally recognized group of media, College Football Hall of Famers and athletics administrators. "We are extremely proud to announce this year's finalists for the Campbell Trophy, who make up the National Scholar-Athlete Class," said NFF President and CEO Steve Hatchell. "These young men have an unrelenting commitment to excellence in all aspects of their lives, and they represent all that is right in college football. They serve as living examples of our mission of 'Building Leaders Through Football,' and we are excited to be able to honor their hard work and accomplishments with postgraduate scholarships." Darlington, who has made 20 career starts, graduated from OU in two-and-a-half years with a 3.91 GPA in Arts and Sciences Planned Program (Health Promotion emphasis) and is working on his master's in Adult and Higher Education (Intercollegiate Athletics Administration emphasis). From Apopka, Fla., Darlington was a CoSIDA First-Team Academic All-American last year as a junior, was named a Dr. Gerald Lage Award winner (highest academic honor given to a student-athlete by the Big 12 Conference) and earned the 1A Faculty Athletics Representatives Academic Excellence Award. The three-time OU President's Honor Roll member earned only two Bs during his undergraduate course work. 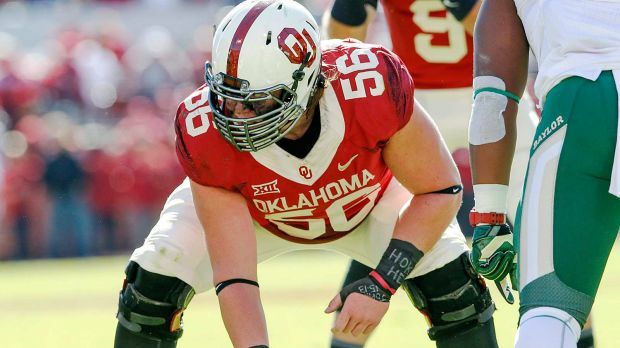 He is a six-time Sooner Scholar and Big 12 Commissioner's Honor Roll selection. Other honors secured by Darlington at OU were the 2015 Letzeiser Award (based on leadership, scholarship and service to the university), the 2015 Dan Gibbens Outstanding Scholar-Athlete of the Year Award, the 2015 Athletics Director's Leadership Award, the 2015 Athletics Council Service Award, the 2014 Sooner Oath Award for male athletes and the 2012-13 Jay Myers Outstanding Freshman Award, presented by the OU Athletics Council. "Ty is an AD-in-training," said OU Athletics Director Joe Castiglione of Darlington. "He may have much bigger sights than that. He's exceptional. I start to run out of adjectives. He's just an extraordinary leader. A lot of times it's his influence by leading by example rather than actually doing something, but he does a lot. I can't say enough about him." Darlington has also made a significant impact off the gridiron on OU's campus, around Oklahoma, the Big 12 region, Florida and abroad. He is serving as 2015-16 president of the Big 12 Student-Athlete Advisory Committee (served as 2014-15 vice president), is one of 15 Division I student-athletes who serves on the NCAA's autonomy legislation committee and was president of the OU Fellowship of Christian Athletes chapter in 2013-14 and 2014-15 (he averages between 10-15 FCA speeches per semester). Darlington also served as 2014-15 president of the OU Student-Athlete Advisory Committee, helped lead the OU football volunteer efforts following the devastating tornadoes that hit Oklahoma in May 2013, volunteers at Oklahoma's Children's Hospital special events, has traveled to Haiti three times as part of the Mission of Hope (earthquake damage relief) and has served as a volunteer football coach at Apopka High School every year since graduation. The NFF National Scholar-Athlete program, launched in 1959, became the first initiative in history to award scholar-athletes postgraduate scholarship for their combined athletic, academic and leadership abilities. Including the 2015 recipients, the NFF has honored 816 individuals with National Scholar-Athlete Awards. The honorees have used the financial support to earn more than 150 medical degrees, 100 law degrees, 80 MBAs and 43 PhDs. Continuing their excellence on the field, 175 recipients have played in the NFL with an average career of six seasons or double the length of a typical NFL player. Past recipients also include 13 Rhodes Scholars. Darlington becomes the 10th NFF National Scholar-Athlete from OU and the first since Gabe Ikard in 2013.